It's been a little over a week since the Anderson-Ericksons moved in. Everyone is doing so great, even the shyest of the herd are warming up. They still have their scaredy-cat moments and a loud noise can send them running for cover. Generally, they are happy little beings and we have won their trust. It's a good feeling. Our friend (and chief medical advisor) Sarah came by to meet the babes this past weekend. Ambrose, who's probably the most interested in us humans, was the first to introduce himself. After a little playtime, he dozed off her arms. Eventually, the rest followed his lead, and snuggled up with Sarah. Nice work, brave little babies. I'm proud of you. Lucky Sarah! And lucky babies. I love these pictures. They are lovely. Keep up the good work on socializing them. We wish we lived in your neighborhood!!! Have a wonderful, restful weekend. Oh! Em! Geee! See me SQUEEEE! Oh fuzzy baby Ambrose! This litter is so darling. I eagerly await the daily updates, see what new things those angels have done. Perhaps Sarah, the chief medical advisor, can also talk a little about the beneficial effects of having a lap full of kittens? Can she write me a prescription for this? It's like there's a big halo of fiber-optic whiskers surrounding the kittens everywhere they go. You know, I keep thinking that every bunch of kittens is the cutest ever. But in this case, the Anderson-Ericksons really ARE the cutest ever -- such adorable babies! I only wish I was in a position to (eventually) give a home to one or two of them -- they're going to be such lovely cats! Lovely lovely lovely. I knew there was a reason why Ambrose captured my attention so quickly! Love that feeling when you win a kitty's trust. Such a boost! 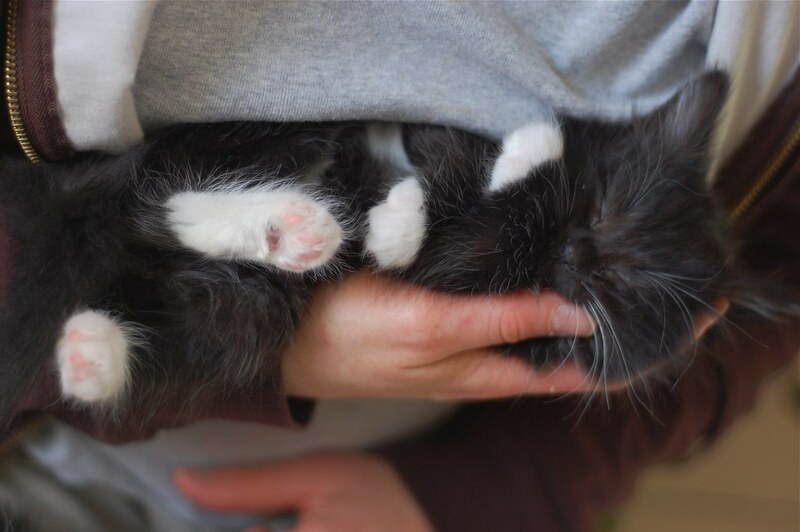 A cuddle of kittens is the bestest thing ever! Good kitty vibes! Yes, there is nothing like gaining a scaredy-kitten's trust! Ambrose looks positively blissed in Sarah's arms, and oh the way the others look up at her with such trust! She must have the gift of kitten whispering, too. The little babies are so very cute!!! I love them!! I too want a lap full of kittens. Write me up a scrip, please. So adorable! I don't know who should be happier, Ambrose or Sarah! Mutual trust and respect. Very, very sweet. I do enjoy a 'warm fuzzy' in every sense of the word. Sigh...makes teh start of my weekend purrty nice! WAAANT Ambrose!!!!! <3 He looks so soft!!! My heart is warming up for that cute little furball! 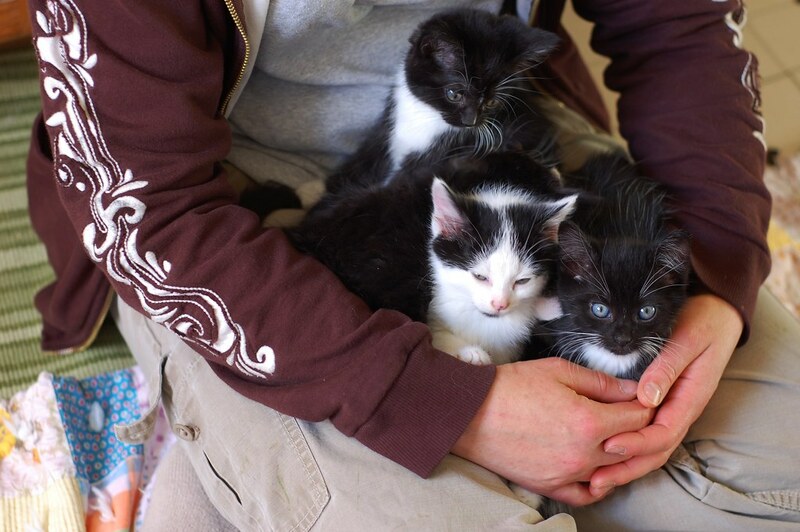 What a wonderful lap full of kittens! Sarah must send out good vibes to cats. Ahhhhhhhhhh! The sound of furrypurry bliss! The kittens was very cute... I can say that the attachment that a cat provides can reduce feelings of stress and loneliness that are associated with depression, one of the most commonly diagnosed conditions. Anyway.. keep posting! I think I have a crush on Ambrose! 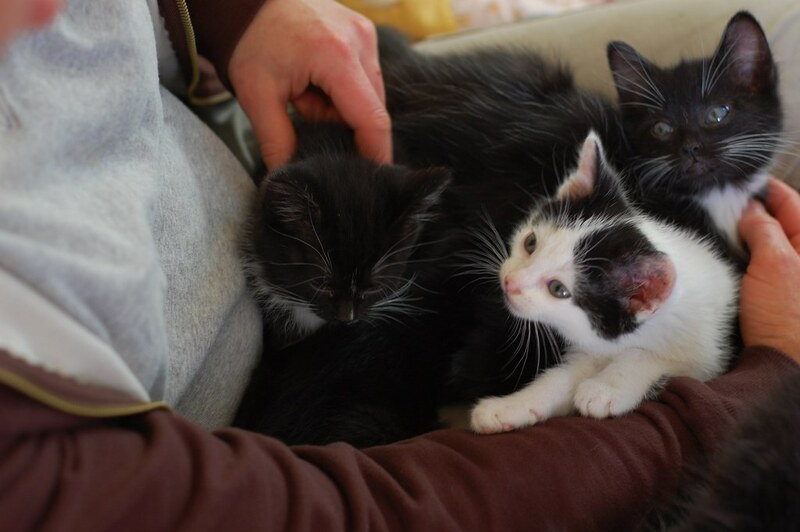 It's lovely to see these dear little kittens being socialized ~ they are going to be wonderfully sweet cats when they eventually find their forever home. Have you ever even had a mean kitty? All of them just seem to be the sweetest kittens ever! Cats, especially kittens are the pets that need affection from their owners. It's nice to see those cute and cuddly kittens. Wish we have a dozen. Cats are lovelier pets. Unlike dogs, cats work in a clean manner. I amazingly love sweety kittens. But I haven't time for it (!